While I was looking around for some new kitchen design ideas I stumbled upon this photo featuring an awesome large kitchen island in a wine cellar motif. I love how this relatively small kitchen is transformed by the incredibly unique vaulted log ceiling and bay window cabinetry. 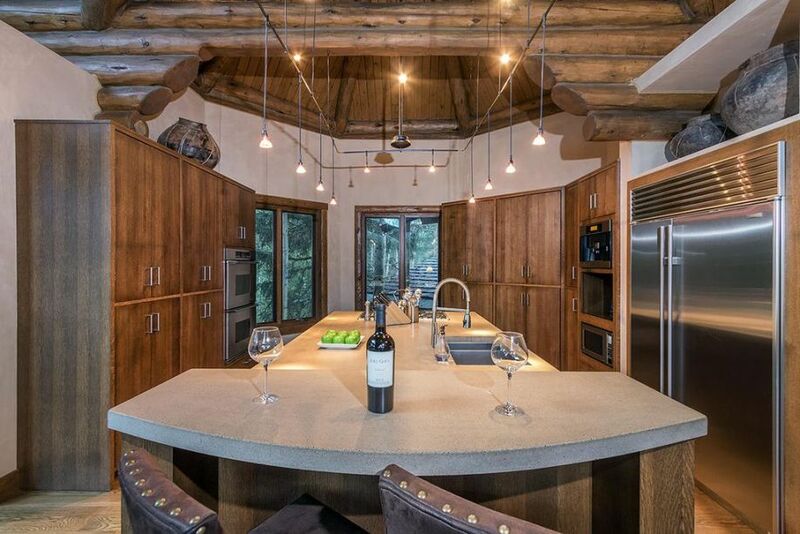 It looks like an old wine cellar mixed with a rustic mountain cabin -- what a cool style. I too have kind of an awkward kitchen floor plan, one that does not house cabinetry and appliances in a symmetric way. For this reason, I am often attracted to kitchen layouts that feature unique shapes and layouts that transform "negative" features into awesome decor statements. When we first sat down with our architect to start planning our new home, I immediately told him that I wanted a kitchen island with seating incorporated. He was not surprised, because apparently this is a very on trend feature in kitchen design for 2019. I know that in the past most kitchen island designs were rectangular and primarily used as an area for extra storage, counter space and to house large appliances like a dishwasher or sink. Sometimes they were peninsula-style and attached to the other kitchen countertops in an L-shaped design. I have been seeing photos of people using a kitchen island cart like this one instead of a large permanent unit all over the place recently and have been contemplating using one in our house. I like the idea of it because it is not permanent so if I change my mind I could definitely remove it and use it somewhere else in the house, it is far less expensive than purchasing matching cabinetry, and it is a lot more versatile than a typical island. We have a an average sized home with a slightly odd layout, so it would be challenging to incorporate even a small kitchen island into our current floor plan. Our galley-style kitchen is quite narrow and, while it does have a lot of cabinet space for storage, I have been wanting a smaller area for prep and just decoration. During my hunt for out of the box kitchen island ideas to incorporate in our home makeover, I came across this super unique design. I love the idea of a classic square island, especially one in a contrasting finish to the rest of the kitchen cabinetry. 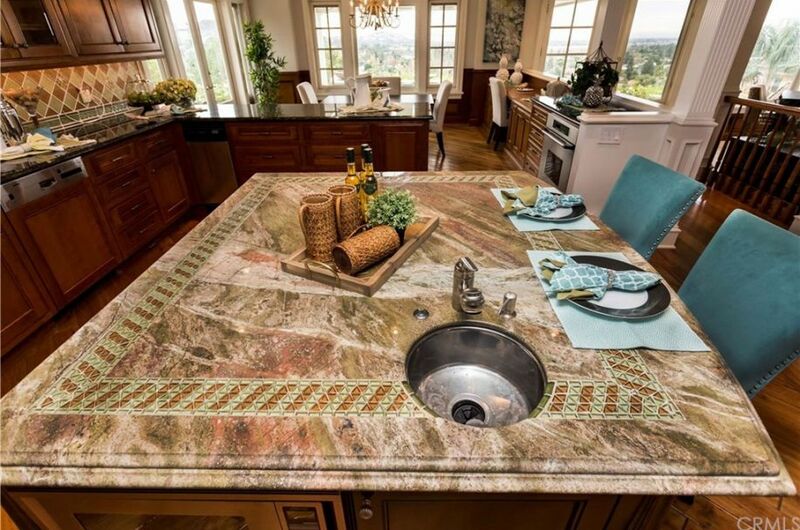 However, I had never seen one in such a beautiful green color with unique tile accented granite countertops before. This multifunctional kitchen island with storage served several purposes in the space. First and foremost, it served as the decorative centerpiece for the room (both literally and figuratively). The eccentric green stain and gorgeous detailing on the countertop is the focal point of the space and actually ties together the design of the entire living area. 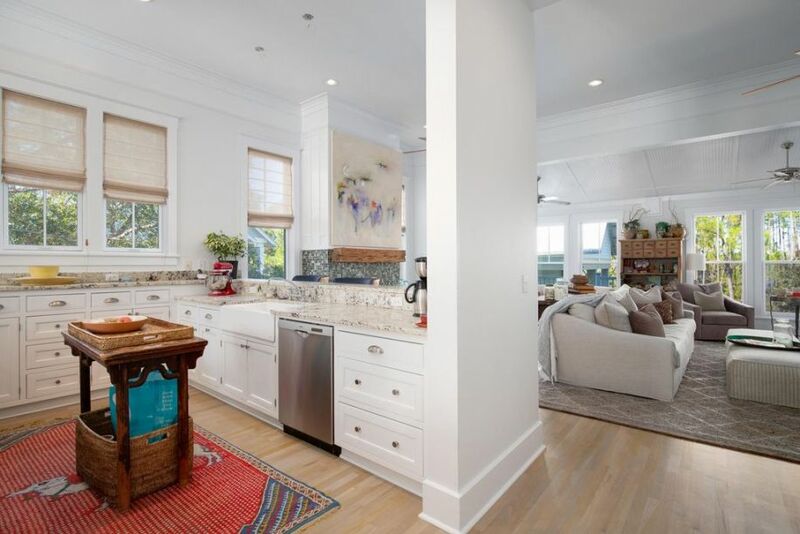 Throughout my search for kitchen ideas to use in our latest home flip, I have seen so many gorgeous all white spaces featuring huge islands with seating as well as cabinet passthroughs into a neighboring breakfast area (this beautiful home has both). I have been very inspired by these elements because I think that they would appeal to a very large range of buyers and could potential set our house apart from similar comps on the market in this neighborhood. The home already has pretty decent looking cabinets, so we are going to clean those up and add a large white kitchen island for more seating and a more updated look. What my home needs is a cool kitchen island with seating for 4 like this one. With our large family, we are constantly in the kitchen while the kids are doing their homework, I am cooking dinner, and the dogs are running around. I would love to have a pretty and uncluttered space like this that they could have plenty of space to do their work while I made dinner overnight. 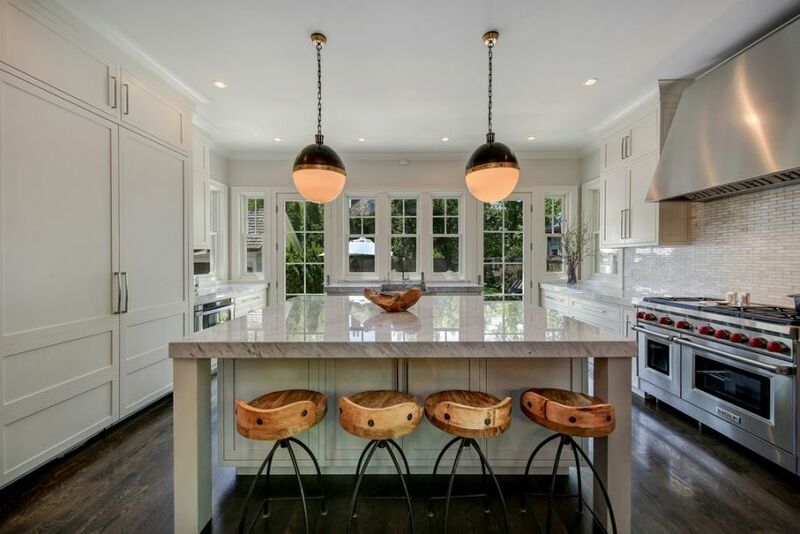 I love how this kitchen island with stools, looks very modern but the shiplap accents on the walls and beautiful wide plank flooring gives the space a decidedly traditional appeal. 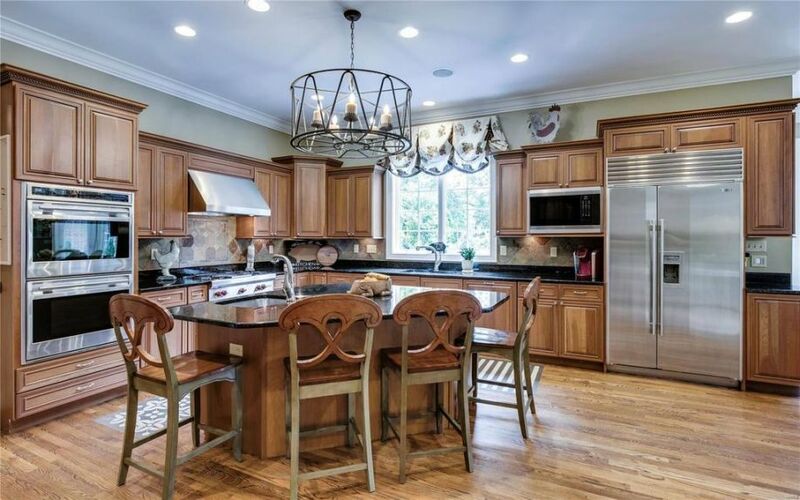 If we ever have the money to revamp our entire kitchen, I definitely want to utilize kitchen island designs like this one to make the space super functional for our family.